I just stumbled over an old post and reading it made me think hard (again). I had never considered the confidence of the lady wearing the burka to have no need to display her body for male approval or the fact that she may actually be the more empowered. I remind myself over and over to try to look from another angle. The older I get, I think I am getter better at seeing it from the other perspective and yet at the same time the more convinced I am that my own angle makes more sense. 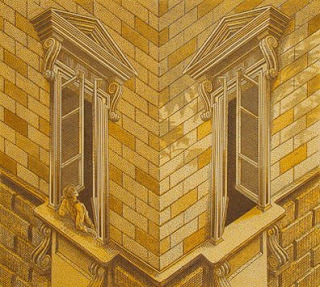 It is important to constantly rethink the way we look at things, is the house concave or converse? Squares A & B are exactly the same. Much like the women in the burka and the bikini. This link was given to me back then by RTFM. 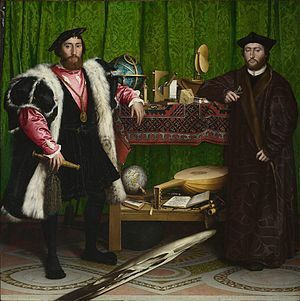 Holbein's 'The Ambassadors' with anamorphic skull. I'm so emotionally led, it is as important for me for something to feel right no matter what the logic says. And it matters not one jot how many logic problem or sudoku puzzles I solve, the lady always spins clockwise for me initially and I have to concentrate to brain hurt stage before I can make her go the other way. Do you see the dancer turning clockwise or anti-clockwise? 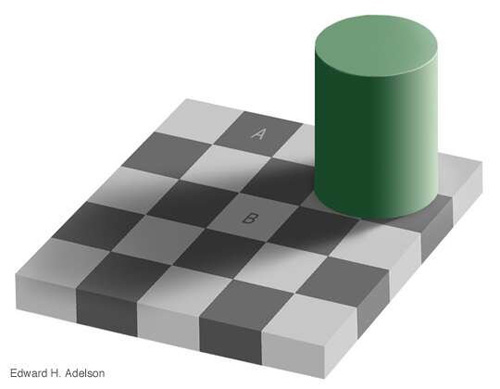 If clockwise, then you use more of the right side of the brain and vice versa. So, the older I get and supposedly the wiser I become, more steadfast in it's ways becomes my brain and my thought patterns. Should I be trying to continue to try to get my mind to push down the walls or do I just find contentment in like minded people and ignore the rest. Maybe, I'll just open a window and let a little air in.